Beluga caviar seized by Italian customs officers is to be distributed to poor people in Milan as a Christmas gift. About 40kg (88lb) of caviar was confiscated in November after two couriers travelling from Poland were stopped with the hidden cargo. Newspaper Corriere Della Sera says the caviar had an estimated value of $550,000 (£370,000). Tests showed the caviar to be edible, so it is to be given to canteens, hospices and shelters for the poor. Beluga caviar is the most expensive variety of the delicacy. 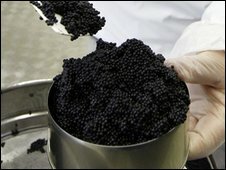 Countries have tried to crack down on illegal trading of caviar after more than 600 tonnes of it were traded in the EU between 1998 and 2004. However, last year the United Nations lifted a ban imposed in 2006 on beluga caviar exports after Caspian Sea states agreed to limit catches of the fish from which it is taken. The ban was implemented because the sturgeon was fast disappearing from the Caspian, the source of about 90% of world caviar.